Page 222 is here! After weeks of build-up, we’ve finally arrived here, in the land of wall-to-wall Nazi fighting! Look at what Sam did there, she’s really mixing things up. Maybe you were hoping for more character development or plot advancement; we’ll get to that, don’t worry, but what I really want to see is some violence directed at Nazis. 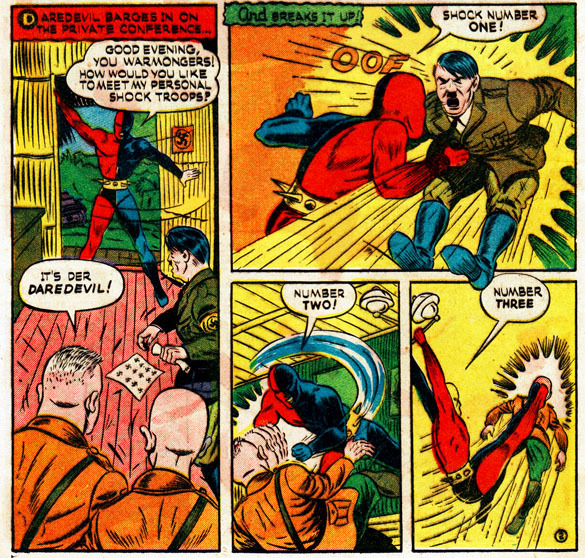 And I wanted to give our guest stars–Octopus Jones, Beowulf, and Bart “Daredevil” Hill–their moment in the spotlight. Octopus Jones appears courtesy of his creator, Joseph Morris of Torc Press , and we’re grateful. Octopus Jones appears regularly in the comic book 7 Worlds, which is well worth your time. Check out Joseph’s Patreon page for plenty more quality entertainment. Beowulf is from the oldest surviving long poem in English; if you haven’t read it, give it a try.